The 4th annual MINTURN MONSTER DASH is a three mile road run in the quaint, historic town of Minturn, CO and includes a family fun run: the CANDY CORN KIDS MILE. The flat and fast (for the mountains) TOMBSTONE TEN MILE includes some dirt road and single/double track trail for even more fun! All races start and finish in the town of Minturn at The Saloon restaurant beside the bridge. The course is on paved & dirt road (+ bike path) and winds through Minturn streets/neighborhoods as well as along the Eagle River. The 10-miler has a dose of smooth, rolling trail. Packet pick up and race day registration at The Saloon on Sunday morning beginning at 9:00 AM. All races start at 10:00 AM. Come in costume! There will be prizes for best costumes in several categories (youngest, scariest, fastest, etc.) so dress for Halloween. Top finisher awards only; no age group awards. 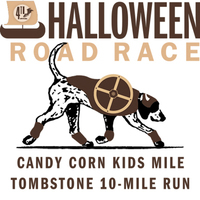 Each runner however will receive a Speckled-Hound Racing beanie and Halloween finisher medal. Fruit, apple cider, and cupcakes at the finish! Lunch specials in-town for racers so patronize Minturn's downtown restaurants, cafes, bakeries and enjoy the Halloween decorations and festive atmosphere. NOTE: All fitness levels welcome. Young children must be accompanied by an adult. Dogs are welcome on the 1 & 3 mile course, but must be leashed. Parking: Park at the Town of Minturn lot across from the Turntable Restaurant. 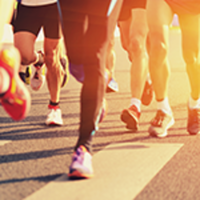 Onsite Registration Available; Note registration price increases for race day sign-up so register online EARLY to get the best price and guarantee a t-shirt in your size.